Manchineel tree at a pond on Middle Caicos. Touching the any part of this tree can cause a nasty rash. The paper wasp can be found on all of the main islands in the Turks and Caicos. 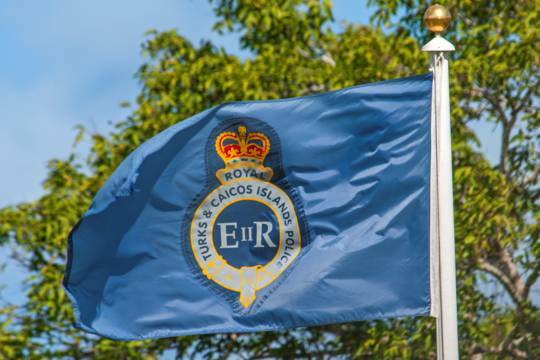 The Turks and Caicos is very fortunate in not having any serious poisonous plant or animal risks. 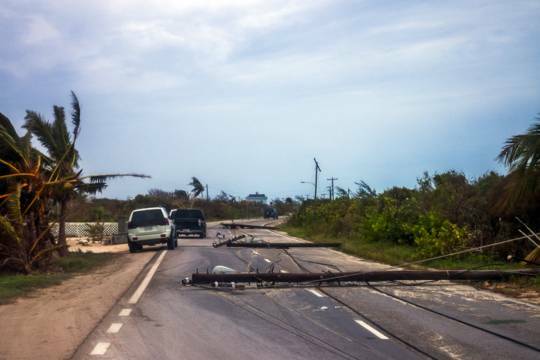 This article discusses the most significant threats. 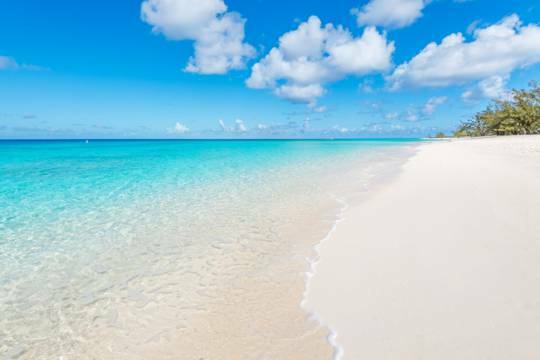 The Turks and Caicos does not have any venomous snakes. There are three types of snakes found in the country: two miniature boas and a very tiny blind snake. These are among the least dangerous snakes that could be found anywhere on the planet. Paper wasps are the only poisonous insects that a visitor might typically encounter. Although paper wasp stings are very painful, they are usually only serious to those who are highly allergic. A giant centipede and the small Caribbean scorpion are found here. 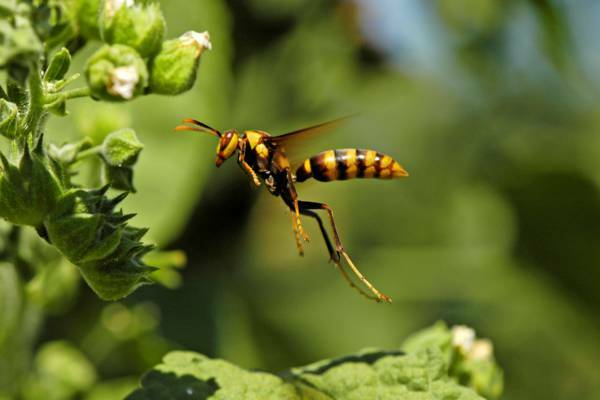 As with the paper wasp, stings are typically only dangerous to those with certain serious allergies. Although a bit scary looking, these arthropods are nocturnal and very uncommon. Both the brown recluse and the black widow spiders have been sighted in the country, but are incredibly rare. 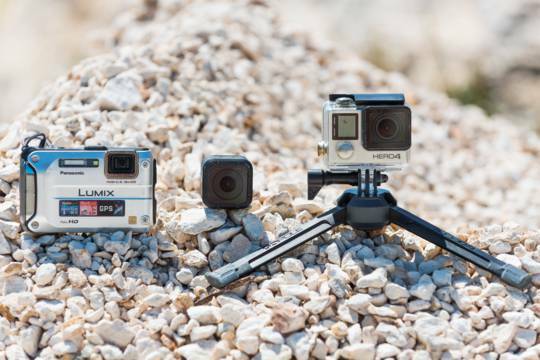 There are no recorded cases of bites from either of these spiders. Leaves from the poisonous Coral Sumac tree. 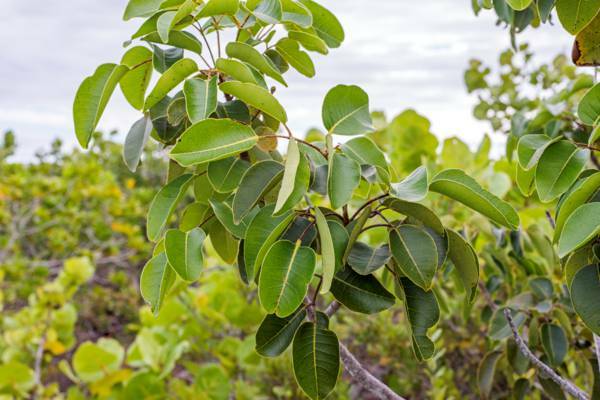 There are two common types of poisonous trees that can cause rashes if touched: the Coral Sumac (Metopium Toxiferum, and also known as poisonwood) and the Manchineel (Hippomane mancinella). Both look alike and are generally found in coastal areas such as the Chalk Sound National Park and in the vicinity of the Crossing Place Trail. Although not life threatening, these trees should be recognized and avoided if venturing off the beaten path. The Manchineel is less common than the Sumac, but it does produce small fruits. Do not touch, pick or eat the fruits. 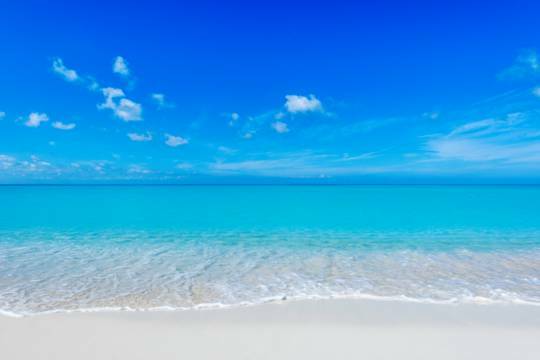 Unlike some other tropical destinations, the Turks and Caicos does not have any wild tasty produce to pick. Much of the “fruit” found growing won’t kill you, but saying that they are an acquired taste would be an understatement. Another plant which is only found at a few locations in the Turks and Caicos is the Rosary Pea (Abrus precatorius). 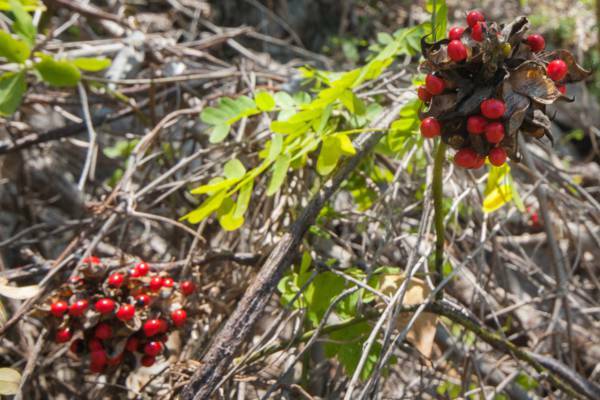 This plant is extremely dangerous and ingesting the small red fruits can be fatal. It is found growing near the Indian Cave on Middle Caicos. This plant commonly has small red pea sized fruits. Leaves from the poisonous Manchineel tree. 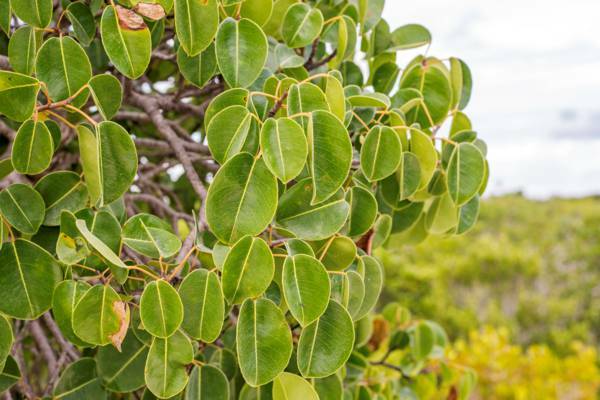 There are a few other native poisonous plants found in the Turks and Caicos, but they are very unlikely to be encountered by visitors. 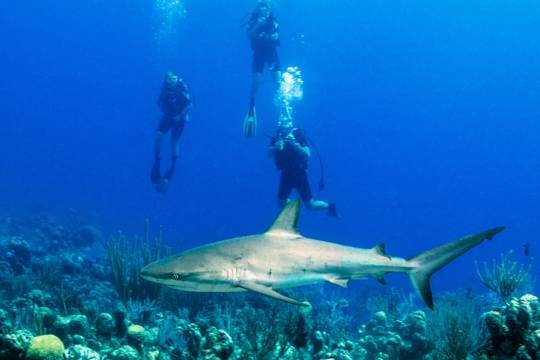 There are a few marine creatures to avoid when in the spectacular ocean surrounding the Turks and Caicos. As is increasingly becoming the case in the Caribbean, Florida, and the warmer Atlantic waters, lionfish can be found here. An invasive predatory species from the Indo-Pacific, these spectacular looking fish have venomous spines on their back and are capable of giving very painful stings. 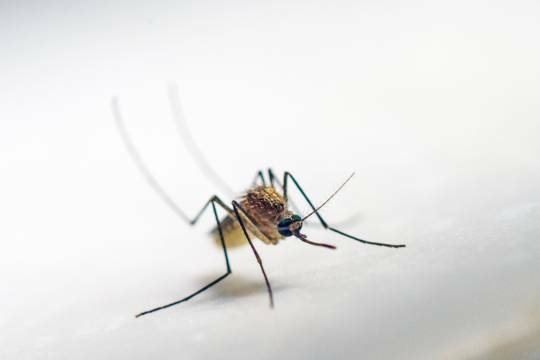 Although extremely uncommon, in worst case scenarios these stings can cause temporary seizures or paralysis. Fortunately, the lionfish are not aggressive to humans and only sting in defensive situations. Upside-down Jellyfish in a Providenciales marine wetland. Closely related to the lionfish, The venomous scorpion fish can also at times be spotted in the water here. A master at camouflage, this bottom dweller has a spine that’s capable of giving a sting similar to a lionfish’s sting. Scorpion fish can be difficult to spot, but are only found near reefs (yet another good reason to not touch or step on the coral!). 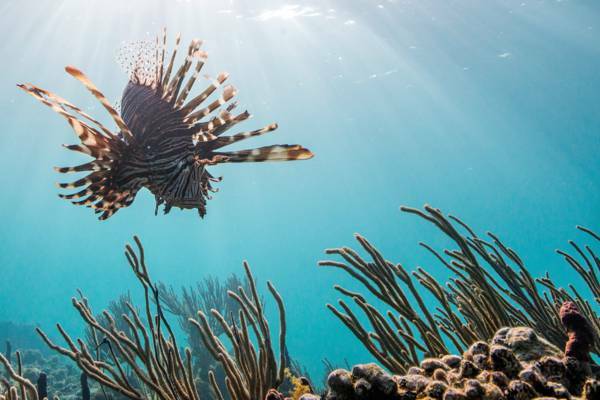 Lionfish are the only fish or marine product that can be harvested by spear in the Turks and Caicos. Hunting for lionfish is an exciting genre of fishing! Various types of Jellyfish can be found throughout the country. 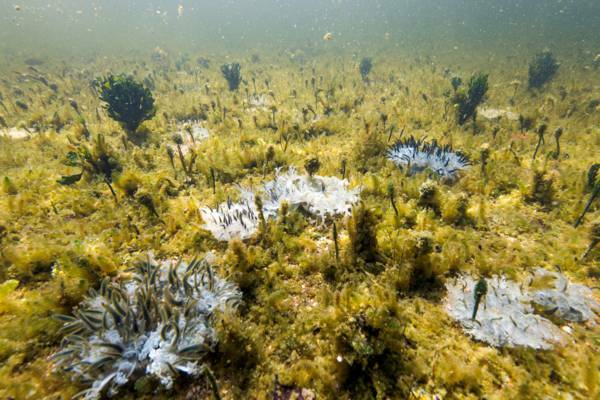 The most common is the upside down jellyfish, which are only found in swampy wetlands and some sheltered canals. The sting from the upside-down jellyfish is quite mild, and typically results in small itchy welts. On rare occasion (most often in the spring months), thimble jellyfish appear in swarms and can disrupt your day at one of the popular beaches. These jellyfish are very small (usually less than an inch in diameter) and the types spotted locally are a transparent green or brown. As with the upside-down jellyfish, the sting from the thimble jellyfish is mild and causes a small itchy rash, but symptoms can persist for more than a week. 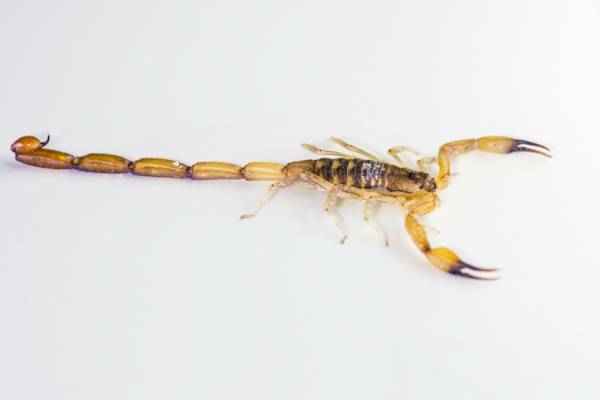 A Caribbean scorpion (Centruroides testaceus) in the Turks and Caicos. In the unlikely event that thimble jellyfish are present at a certain area, we recommend that you simply choose another beach. It’s important to be aware that both the jellyfish and their larvae (almost impossible to see) can cause the stings, so it’s best to avoid the location with the jellyfish rather than just the jellyfish themselves. Other varieties of larger jellyfish are sometimes spotted (often in the deeper water), but are uncommon enough to be more of a curiosity than a nuisance. Several types of coral-like hydrocorals are capable of giving stings if touched, which may result in instant or delayed pain, itching, or swelling, similar to the symptoms of a jellyfish sting. Stinging hydrocorals can appear like both hard and soft coral, but the most common variety in the Turks and Caicos is the yellow branching fire coral. For the wellbeing of yourself and the environment, don’t touch anything on the reef! A Lionfish at the Bight Reef, Providenciales.